Barrington will celebrate Cynthia Rowley on May 29 through June 2, 2018, as the renowned designer comes back to her hometown to celebrate with a Pop-Up Shop and special public and private events throughout the weekend at Barrington’s White House. Cynthia Rowley is a graduate of Barrington High School and the School of Art Institute of Chicago. At the Art Institute, she pushed the boundaries of fashion and used her experience (and just $3,000 in seed money) to venture off to New York City to build her global lifestyle brand, consisting of ready-to-wear, swim/surf, fitness, accessories, home decor, and a new men’s collection. A favorite among celebrities and high-profile influencers alike, Rowley has signature shops in New York, Charleston, Malibu, Montauk, Miami, Palm Beach, Atlanta, Aspen, and her personal favorite location on Damen Avenue in Chicago. She has appeared on America’s Next Top Model, Project Runway, David Letterman, The View, and Oprah, among others. For behind the scenes adventures around the world, follow @cynthiarowley on Instagram. Tuesday-Thursday from 11:00 a.m. – 7:00 p.m.
Friday from 11:00 a.m. – 5:00 p.m.
Saturday from 10:00 a.m. – 3:00 p.m.
On Friday evening, June 1, Ms. Rowley will arrive in town, and the community will welcome her with a champagne and dessert reception ($50) at the White House, open to the public. The Pop-Up Shop will be open that evening to ticketed patrons. On Saturday, June 2, at 11:00 a.m., the White House will present an hour-long “Conversation with Cynthia Rowley” ($20). On Saturday evening, Rowley will be the honored guest at a special gala fundraiser in support of the Friends of Barrington’s White House, which will feature a spectacular live auction item – a 5-Day Cynthia Rowley New York Fashion Experience, plus a special piece from her collection. This event will launch the Friends of Barrington’s White House 501(c)(3) to raise funds for the Capital Reserve Fund to ensure we preserve the home’s quality restoration and classic beauty. The net proceeds from the weekend and 10% of the sales from the Pop-Up Shop will be directed to the Capital Reserve Fund. Raffle tickets for Cynthia Rowley merchandise will be available during the Pop-Up Shop hours. 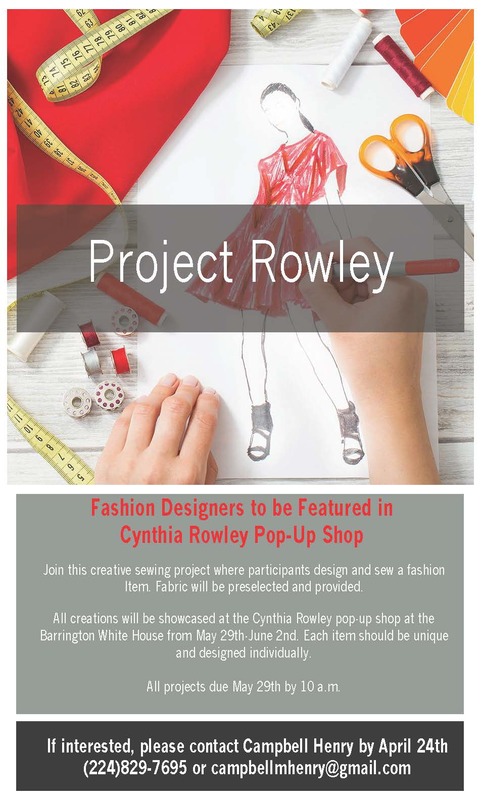 In addition, the weekend will feature a “Project Rowley” creative sewing project where participants of all ages design and sew a fashion item to be showcased at the Pop-Up Shop from May 29-June 2. Fabric will be preselected and provided. Each item should be unique and designed individually, and the public will vote on their favorite. There will be two age groups – under 18 and over 18. All projects are due May 29 by 10 a.m. If interested, please contact Campbell Henry by April 24th (224) 829-7695 or campbellmhenry@gmail.com. For more information on all weekend events, go to www.barringtonswhitehouse.com. Tuesday – Thursday, May 29-May 31 •Pop-Up Shop, Barrington’s White House, 11:00 a.m. – 7:00 p.m.
Saturday, June 2, 7:00 p.m. •An Extraordinary Evening with Cynthia Rowley Gala Dinner to Support the Friends of Barrington’s White House Capital Reserve Fund (Tickets $500). For information 224-512-4066.